An enterprising Port Huron news reporter was credited with saving the lives of 23 crew members aboard the ill-fated freighter Joliet following the boat’s sudden destruction on the St. Clair River. Dan Lynn heard the crunch when the anchored steamer was struck broadside by the passing freighter Henry Phipps at about 2 a.m. He realized there had been a collision and took his private boat out in the fog-bound night to get a close-up look. The sinking during the early morning hours of Sept. 22, 1911 was so sudden and unexpected, many crew members were left swimming for their lives. Others were clinging to the rigging on the foremast, which was still showing above the water when Lynn’s boat arrived. Lynn found the Joliet lying sunk, but still upright in about 40 feet of water. The wreck was located just below Miller’s Coal Dock in the river. All that remained to be seen was the mast, the smokestack and the tip of the pilot house. Two sailors, identified as second engineer George Tucker and first mate Mitchell Duffel, were clinging to the ropes on the mast. Lynn took them in his boat and brought them ashore. He later returned to help pull several other swimming sailors out of the water. Still others were brought ashore in lifeboats launched from the Phipps, which although extensively damaged, did not sink. It anchored downstream after the crash. One of the Joliet’s lifeboats was launched, but the steamer sank so fast that only a few of the men had time to get in it. First Engineer Gustive C. Deaska of Chicago almost died when he went to his cabin to try to save some personal things. As he fought his way back to the deck, there was an explosion. Deaska was hurled an estimated 30 feet and landed in the river. He was clinging to a piece of floating debris when rescued. Ironically the collision occurred because the Joliet’s master, Capt. H. F. Clagg, worried about taking the ship down the river at night in thick fog. He decided to play it safe and brought the boat to anchor at about 11 p.m.
Three hours later the downbound Phipps, commanded by Capt. B. F. Humbiffe, slammed into the side of the standing freighter. 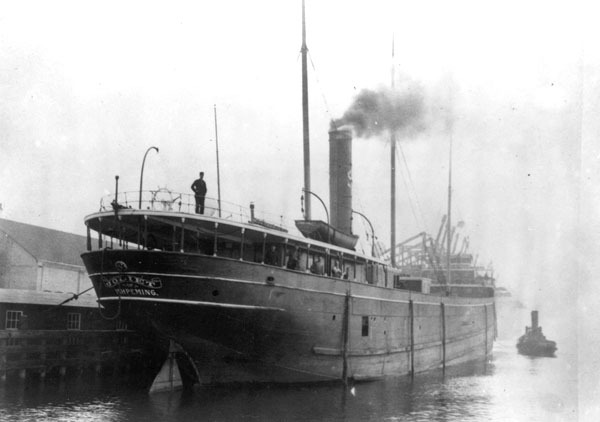 Both ships were owned and operated by the Pittsburgh Steamship Co. The Joliet was never salvaged. The wreck was dynamited to clear the river for navigation. The debris was removed by the U. S. Army Corps of Engineers in 1963.